At Oubre Orthodontics, our mission is to help patients throughout the greater Lafayette, LA area achieve beautiful, healthy smiles through convenient orthodontic treatment. We offer a wide range of treatment options to suit the diverse needs of our patients, and we work with you to customize treatment to suit your lifestyle. But while the care we provide in our office is vital to your new smile, the care you take at home is equally important – and regular brushing and flossing are a fundamental part of that care. Daily brushing and flossing are vital to healthy teeth, but while you're undergoing orthodontic treatment, they become even more important. 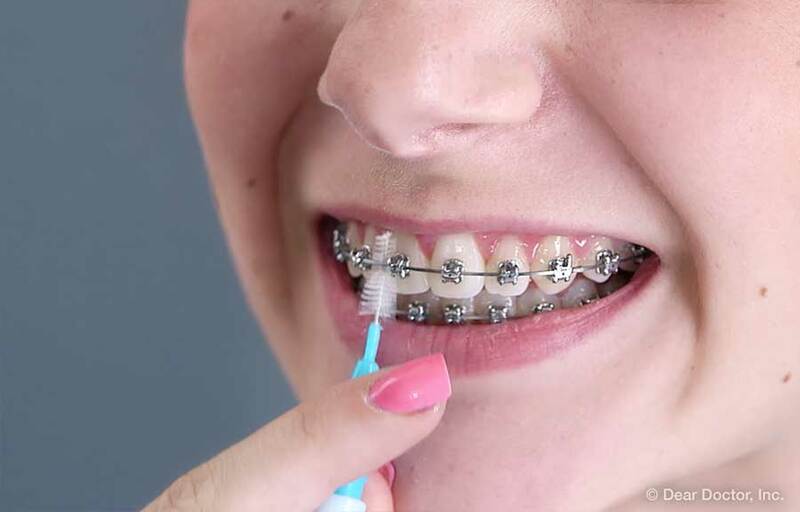 That's because your teeth are more vulnerable to decay during orthodontic treatment: the nooks and crannies of both metal braces and clear braces make the perfect hiding places for food particles, and it's all too easy for bits of food to get stuck under Invisalign aligners and cause tooth decay. With proper oral hygiene, however, this won't be a problem. While wearing braces, we recommend you brush your teeth at least four times per day: once after every meal and once before bed. You should brush for two minutes each time, working to clean every surface of your teeth and braces. Take care to thoroughly clean the spaces between wires, brackets, and teeth, as food particles can easily get cracked in these areas. We recommend using a soft-bristled or bi-leveled toothbrush to clean your teeth, depending on your preference. Using fluoridated toothpaste, place the bristles flat against your teeth and use small, circular motions to scrub them clean and remove food particles. Be sure to get every part of your teeth, including the chewing surfaces and the inside of the teeth. After brushing the teeth straight on, tip the bristles towards the gums and clean the area between the braces and the gums. The most important thing is to ensure you clean every exposed surface of the teeth. In addition to brushing, you'll need to floss your teeth at least once a day. 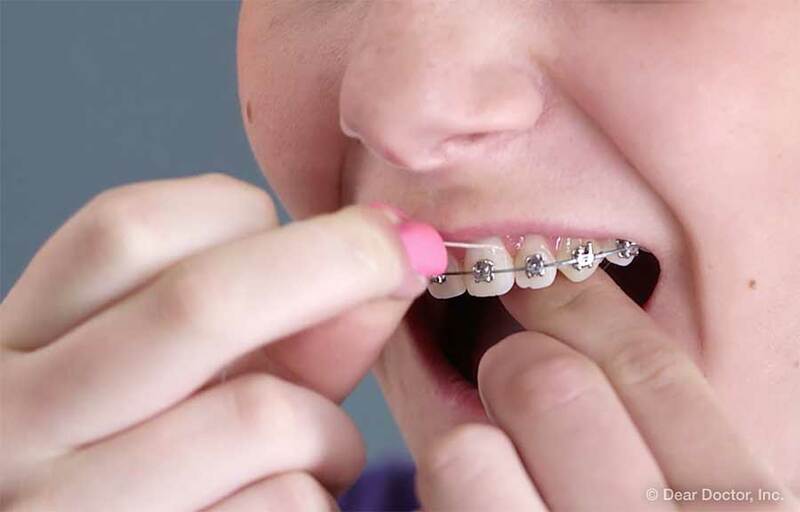 To do this, you'll need a floss threader: a thin plastic loop with a long, pointed end. To use this, thread your floss through the "eye" of the threader, then carefully fit the long end underneath your archwire and pull it through to get your floss underneath the wire. Once your floss is under your archwire, you can simply grab both ends of the floss and floss that tooth normally. Repeat this process for each space between the teeth, taking care to floss from the top of the tooth to below the gumline. 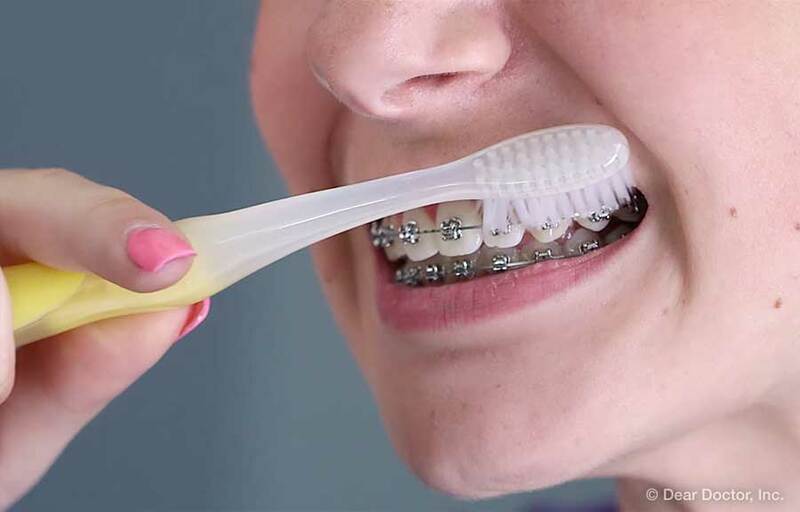 Daily brushing and flossing are the fundamentals of oral hygiene with braces – but there are a few other tools that can help to protect the health of your teeth during treatment. One of these is an interdental toothbrush, also called a proxabrush. This is a small, cylindrical brush that looks something like a pipe cleaner. It’s a great tool for cleaning on the go and dislodging bits of food that get stuck in your braces. In addition to an interdental brush, you may also consider an oral irrigator or "water pick." This is a device that fires a small, high-pressure jet of water at and between teeth. This jet can dislodge food particles from between your teeth and the nooks and crannies of your braces, helping to prevent decay. Both of these devices can be highly useful for keeping your teeth clean during treatment – but remember that neither is a substitute for brushing or flossing. You should only use these devices as a supplement to your oral hygiene regimen, not a replacement. But what if you're straightening your teeth with Invisalign? Lucky you! Because Invisalign is removable, you won't require any changes in your oral hygiene technique – simply remove your aligners and brush and floss your teeth as normal. That said, you'll need to be more diligent about oral hygiene than normal. You'll need to brush your teeth after consuming anything besides water, including small snacks and drinks like coffee. This is because even a small amount of food or acidic liquid can get trapped underneath your aligners, creating the perfect environment for tooth decay. Cleaning your teeth before putting your aligners back in is vital to ensuring healthy teeth and successful treatment. If you're looking to take your oral hygiene to the next level, we'd recommend trying a special tool called "disclosing tablets" or "disclosing solution." These use special vegetable dyes to highlight food particles, bacteria, and plaque deposits on the teeth, showing you where your teeth need cleaning the most. A great idea is to use one after cleaning your teeth normally – this will show you where your technique could use improvement for next time. Oral hygiene is a vital part of successful orthodontic treatment. With proper care, you can keep your teeth healthy and strong, ensuring successful treatment and protecting your smile for a lifetime! Feel free to contact us if you have more questions about oral hygiene and orthodontic treatment, and don't hesitate to request an appointment online if you'd like to come in for a consultation. We can't wait to hear from you, and we're excited to help you achieve a beautiful new smile!